Monsoon is the season of rain, it is also the season enjoyed by children, adults, aged or I should say by every section of the society. However everything has bright and dark sides. Similarly, rainy weather brings along it some small problems which need to be taken care of. Rain water when get mixed with dust forms mud which is the thing which is most likely to be hated by everyone as everyone wants to see them clean but it is not possible to enjoy rain without being getting dirty, but however it is possible if we take care of this by using proper accessories to deal with the situation. 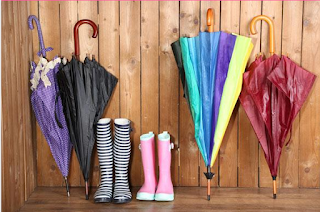 I read an article related to give must have accessories in the monsoon season and mentions about umbrella, proper footwear, door cleaning mats, liquid hand wash and hand towel. I find this article really useful as next time I can use these things to make I enjoy the monsoon better and travel without getting wet and stay healthy. I completely agree with the article and find Umbrella is the most important equipment in rainy weather as obvious it is it prevents from being wet from the rain. It helps to deal with the daily routine of a person even in heavy rains. One of the simplest of the machines but is very much efficient. Nowadays, many kinds of umbrellas are available in the market according to the needs and design required by different sections of the society. Footwear also plays an important role as it helps in protecting us from the muddy surroundings and also helps in giving grip to the body so that it functions even in wet environment without any difficulty. Footwear is also important as when we move droplets of mud may come and strike our clothes however, appropriate footwear avoid such things and helps to keep us fresh throughout the day. Door cleaning mats are also very much important. In rainy days there is a lot of increase in germs in the environment and door mats are something which helps in keeping the environment around us clean. They are used in offices, hotels, shops, and even in bedrooms to create a clean and healthy environment. Nowadays, there are a variety of door cleaning mats and they not only help us in making the environment clean but also add to the style and beauty of the rooms, shops, offices, etc.Liquid hand wash which I believe is the most important one among the all, as it helps in making the environment as well as ourselves clean from germs and various bacteria which grows during the monsoon. Dettol is used in cleaning, bathing, also used as a soap which protects us from germs throughout the day. It is also an antiseptic which also prevents allergy to the injuries like cuts. Hand towel, also another important commodity is very much helpful to keep yourselves clean and dry throughout this wet and humid weather. It is very much important to have a hand towel in a daily routine. All these five things mentioned in the article are worth to buy and I am going to have it for sure this monsoon season.